The day UC head basketball coach Mick Cronin announced that he was leaving for UCLA I decided I needed a beer. Looking for a place I hadn’t been yet I went to a Cincinnati area OG, Rivertown. The basketball program was without a captain at the helm. I sought out a barrel house. 6550 Hamilton Lebanon Rd, Monroe, OH 45044. The Outlet malls and IKEA are very close, making Rivertown a must see after a shopping spree or getting lost in IKEA for over an hour. Rivertown is big. It’s much bigger than I imagined, for whatever reason. I walked in and was pleasantly surprised at the vibe. I definitely got more of a sit down restaurant feel when I walked in. A hostess greeted me upon my arrival and showed me to my seat at the bar. There’s plenty of seats at the bar. There’s plenty of seats everywhere. One of the first things I noticed was the arcade, pictured above. I’ve not been to a brewery with an arcade before, it was awesome. What’s better? Most of the games are free. FREE! Along with the arcade you’ll find a swag wall for merchandise. I took home a 6 pack of Kontrola, one of my favorite Czech Pilsners. If their taproom floor isn’t big enough for you the patio opens May 1st for your outdoor drinking delight. Coming back inside and sitting at the bar you can see the brewhouse through the windows behind the bar. Usually, on weekends you can take a tour of their facility. 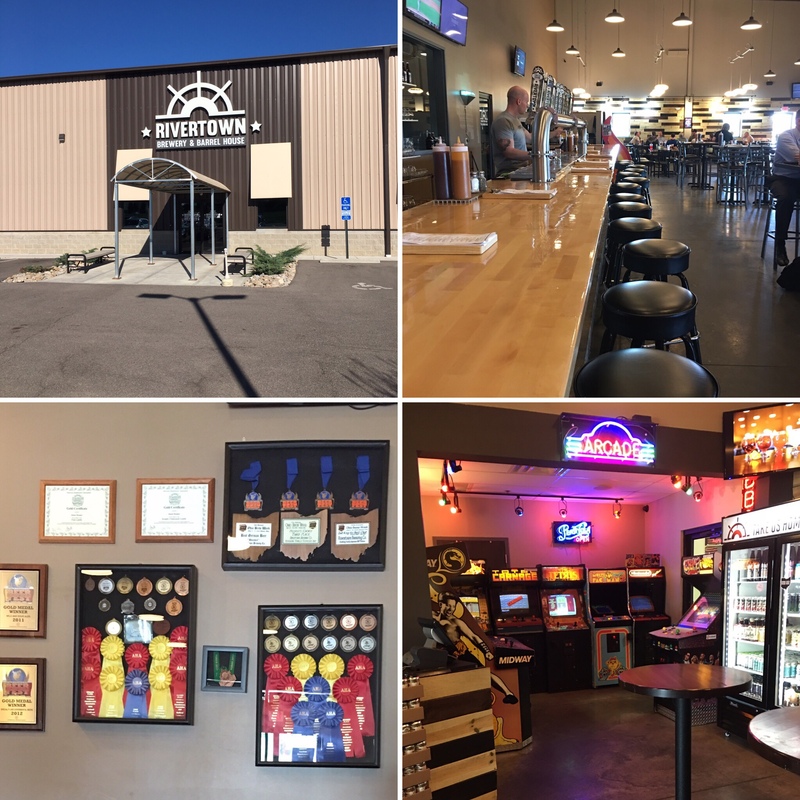 It was my lucky day that Tuesday because I got to go behind the scenes and see everything from their impressive wall of barrels, to the brite tanks, fermenters, and semi new canning line. It was educational and exciting. Those two things don’t always go hand in hand, but its beer! Rivertown has a full kitchen and extensive menu. 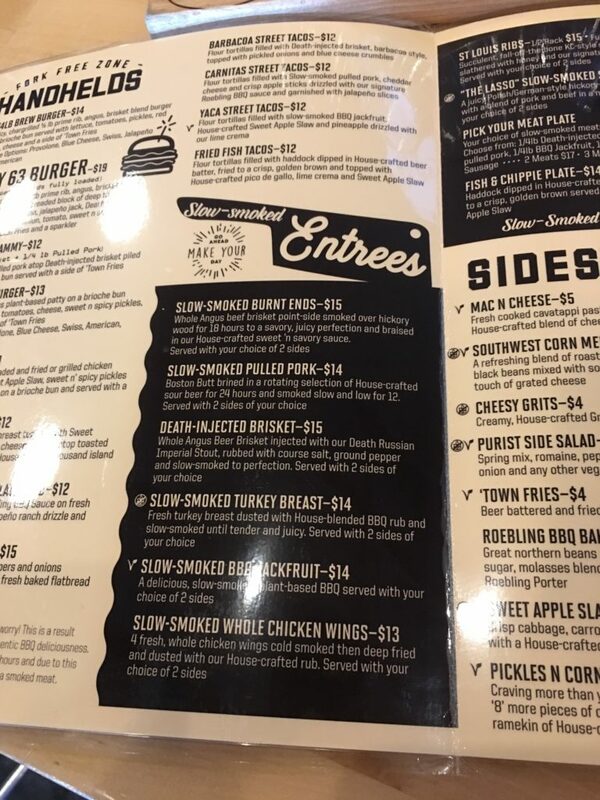 They’re known for their smoked meats but they something for everyone. Come hungry because even though I didn’t eat on this visit everyone else in the place was and it looked and smelled delicious. 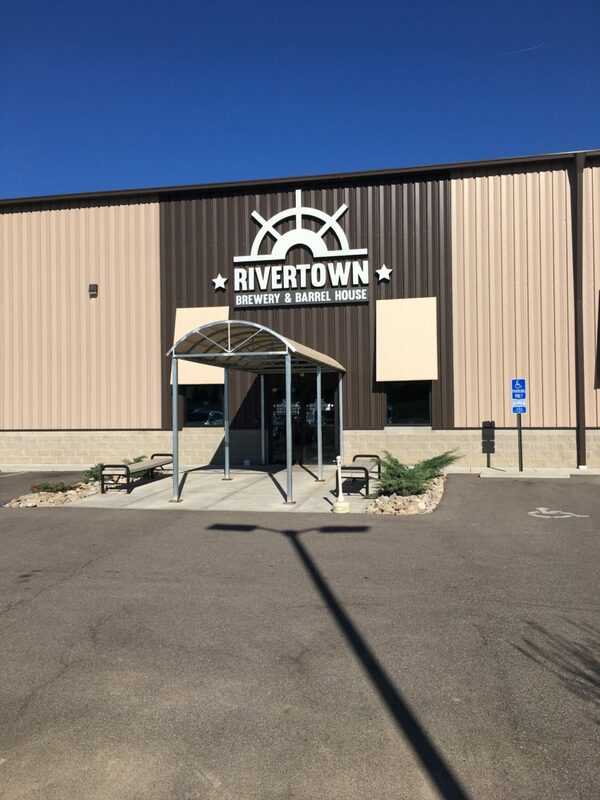 Want to try out some Rivertown food but don’t feel like getting up or going anywhere because you’ve already started drinking? You’re in luck because you’ll soon be able to order items from their menu via Door Dash. When that is exactly launching isn’t clear yet but it’ll be soon, very soon. Slow and smoked is the way to go. Rivertown had a lot of beers on tap. More than I cared to count. They recently brought back their pumpkin beer. To me, it’s one of the best pumpkin beers I’ve ever had. I know some people hate on them but being an October baby I’m kind of partial to them. I also heard that this isn’t the only vintage beer they’re brining back, but we’ll have to wait and see. They’re also starting to release a handful of one offs and different variants. For you Untappd obsessed drinkers this gives you an excuse to go check them out to see what you can check into next. I, of course, ordered a flight. I tried to hit as many different styles as I could and definitely checked that box on my visit. The flight of 6 was an awesome concept but also pretty understandable when you see how many options they have available. Here are my top 3. 3. Pineapple Whip on Nitro. I think nitro beers are hit or miss, especially if you try it with IPA or something. Pineapple Whip though, knocks it out of the park. At 4.1% ABV it won’t put you under the table. Its creamy, fruity, slightly tart, and perfect in sunshine. 4/5. 2. Pinky Promise. It’s a brut IPA checking in at 7.9% and 30 IBUs. Like NEIPAs everyone is developing an opinion on the brut IPA. I’ve had some I’ve really enjoyed and I’ve had some I probably will never drink again. Pinky Promise holds a unique twist to the style. It’s fruity and brewed with guava. I’d compare it to pink lemonade and another sunshine drinker. 4/5. 1.Praxis. A lambic-Kriek. More commonly recognized as maybe being a cherry sour. Without getting too technical or going down a yeast rabbit hole, know this, the beer is brewed spontaneously because the yeast that ferments it is spontaneously produced in house. This beer is aged in oak wine barrels for over a year. It’s tart, sour, tastes like cherries and leaves a lingering taste on your palate. It checks in at 6.2% ABV so in my opinion is in the middle of the road in that category meaning you can have more than one. It was easily my favorite beer of the day. 4.25/5. 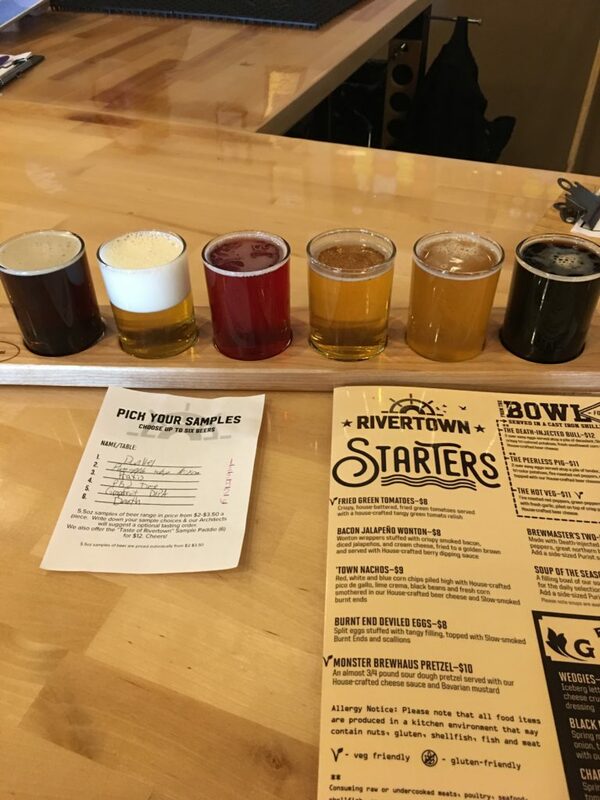 Rivertown is one of the places you have to visit to understand the recent history of Cincinnati craft beer. You’ll see them around town at some upcoming events such as the Summer Beerfest, OktoberFest, as well as the Cincy Beer 5K, of which they’re a sponsor. They’re open 7 days a week but hours do vary slightly. Go check them out and tell me what you think! Be sure to follow along with GoBeercats on Twitter Untappd, Instagram, and Facebook! Subscribe to GoBeercats and get blog posts send directly to your email.